Super Eagles forward Odion Ighalo says Tuesday's crucial World Cup Group D match against Argentina in St Petersburg will be like "a final". "It's going to be war (and) a final of finals because they need to win," Ighalo told BBC Sport. "They are going to come all out and (use) every tactic that they know to win a game." The match between Argentina and the Super Eagles will be the fifth World Cup tie between the sides - with the Super Eagles losing all five matches. Croatia have already qualified for the next round after their wins over Nigeria and Argentina. So, there's one spot left for Nigeria, Iceland, and Argentina to fight for. "I am expecting it to be a very tough game but I think we are capable of qualifying," said Ighalo. The Super Eagles 2-0 win over Iceland put them in pole position to take the last qualifying spot as Argentina and Iceland only have from points after both teams played a 1-1 draw in their first game. 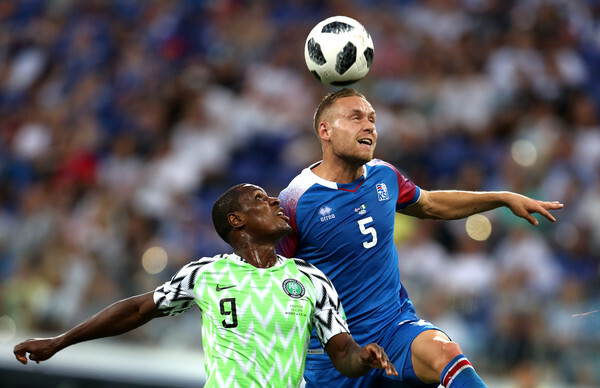 Odion Ighalo was dropped in the win against Iceland, Gernot Rohr changed his tactics for the game switching to a back three and playing with two strikers in Ahmed Musa and Kelechi Iheanacho. The 29-year old forward was happy with the switch in tactics despite been on the bench. "It makes it easier because I was isolated (against Croatia) - alone with four different guys - which was very difficult but we played with two strikers (against Iceland), which is much easier for the strikers to move, to come, and you can see that we got goals," he explained. The former Watford striker said the poor display in the 2-0 loss to Croatia angered the players and they have been determined to put things right since then. "After the last game, Nigerians were disappointed. They were not happy and saying a lot of things about the team but now they are having the confidence back," he said. "We (also) were not happy. We were a little bit angry because we knew we had to step our game and to do better. The mood is so high now in the dressing room because when you win games, everybody is happy. So we want to keep that until our next game." Ahmed Musa is Nigeria's top scorer in World Cup history with four goals, he scored a brace against Argentina at the 2014 World Cup prior to his two goals against Iceland. Only Ghana's Asamoah Gyan, with six, and Cameroon's 1990 World Cup star Roger Milla, with five, have ever scored more at the finals for Africa. With three of the continent's sides - Egypt, Morocco, and Tunisia - having exited after just two games, the China-based striker says Nigeria are very conscious of the need to salvage African pride in Russia. "That is why we have to do better and step up our game, because two Africans are already out and a loss (against Iceland) would have pushed us out of the tournament," said the China-based forward. "We know Africans are back there supporting us and Senegal." The Senegalese will have to avoid a defeat in their last group game against Colombia to qualify for the round of 16.